The former U.S. National Forest Service supervisor who lives in the south of Oconee County will challenge incumbent Republican Bill Cowsert, an Athens attorney, in November. Hilliard has no opposition in the Democratic primary on May 22, and Cowsert has no opposition in the Republican primary on that same day. 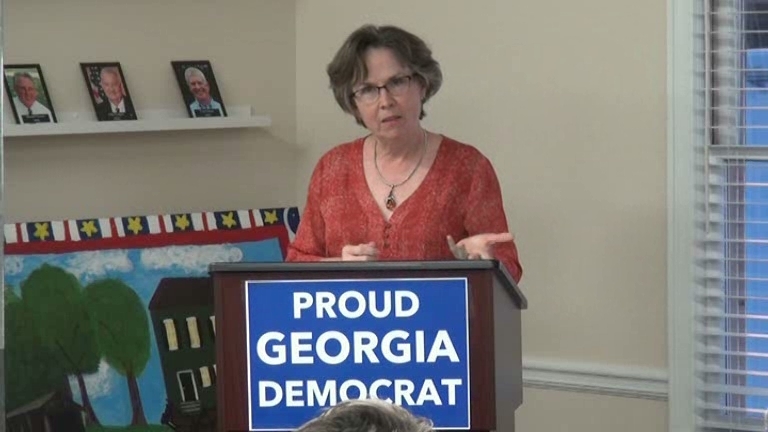 Hillard followed John Noel, a candidate for the Georgia Public Service Commission, to the podium at the Oconee County Democratic Party meeting, attended by 32 persons and held at the Chamber of Commerce in Watkinsville. Noel told the Oconee County Democrats at the March 20 meeting that Georgia Power “is running the Public Service Commission” and the result is that Georgia consumers are paying unacceptably high rates because of the company’s delayed Vogtle Nuclear Power Plant. Noel, who owns an energy efficiency business in Atlanta, has two Democratic opponents in the May 22 primary for the District 3 post on the Public Service Commission. They are Johnny C. White, an IT consultant, and Linda Miller, a businesswoman. The winner of the primary will get the chance to challenge incumbent Chuck Eaton in the election on November 6. John Hutchins, who works in solar advocacy, is challenging incumbent Tricia Pridemore in the Republican primary for District 5 on the Public Service Commission, while Dawn Randolph, a consultant, and Doug Stone, a business owner, are competing in the Democratic primary. The Commission has five members, all Republicans, and District 3 is labeled the Metro-Atlanta District. District 5 is the Western District. Though each candidate must be a resident of the district she or he represents, commissioners are elected by a state-wide vote, not only by voters in the district. Oconee County is in District 2, represented by Tim Echols. Commission members serve 6-year terms. Hilliard began her presentation by relaying a text message that a student at Florida's Marjory Stoneman Douglas High School sent to her parent when the shooting took place there on Feb. 14. The student asked her parent to call 911, and Hilliard said this was a message no one ever wants to get. Hilliard critized incumbent Cowsert, who is Majority Leader in the Senate, for blaming mental illness, the lack of security at our schools, “and the fact that too few guns are in the hands of good guys” for the gun violence. All of Oconee County falls in the 46th Senate District, which also includes the western part of Clarke County and almost all of Walton County. Hilliard said that voters in Georgia say that education is their number one issue. “We understand that good education is the key to a quality of life with individuals and throughout our communities,” she said. “We need to promote early education, increase school funding, provide better pay for teachers,” she said. The state also needs to invest in its technical schools and reduce the costs of university education, she said. Before Noel and Hilliard spoke, four other local candidates introduced themselves to the gathering. Andrea Wellnitz, running as a Democrat in November for Post 2 on the Oconee County Board of Education, and Fran Thompson, running as a Democrat for Post 3 on the Board of Education, spoke briefly. Two Superior Court Judge candidates also spoke. Incumbent Eric Norris asked for support from the Democratic audience. He is being opposed by Allison Mauldin. The race is nonpartisan. Lisa Lott, who is challenging incumbent Regina Quick for another Superior Court Judge position, also addressed the group. That election on May 22 is the only contest between the competing Superior Court Judge candidates, with the winner assuming the judgeship. Savannah Steet from Oconee County High School Young Democrats told the group about a ultimate frisbee fundraiser Young Democrats at the two Oconee County High Schools are holding at 1 p.m. on Sunday at Oconee County High School. The $15 registration fee will go to support Area Churches Together Serving, 130 E Thompson Street, Bogart, an organization supported by local churches to provide food and clothing for the needy. Participants are being asked to bring canned goods to contribute to the food drive of ACTS. It is possible to sign up online for the event. Steet also reported that “almost everybody” at her high school walked out into the hallway as part of the 17-minute national school walkout on March 14 in honor of the 17 people killed at Florida's Marjory Stoneman Douglas High School. 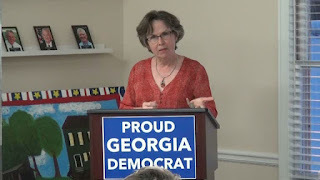 The video below is of the entire meeting of the Oconee County Democrats, including of the business meeting of the Oconee County Democratic Committee at the end. Wellnitz introduced herself at 2:34 in the video. Wellnitz was followed by Thompson at 3:30. Norris spoke at 5:12 in the video. Lott made her comments at 8:39. 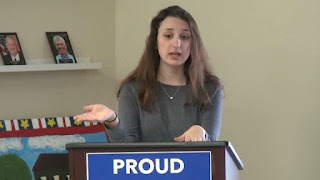 Steet gave her report on the Young Democrats at 11:02 in the video. Noel began his talk at 30:10. Hilliard started speaking at 53:08. 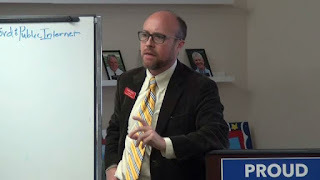 OCO: Oconee Democrats 3 20 2018 from Lee Becker on Vimeo. One must hand it to local Democrats: They run one candidate only. Mr. Cowsert will have to suffer through a few "debates" and "political forums" for appearance's sake. Here is hoping he'll have the numbers, facts, logic, and law to meet the leftist opposing him for November. I think he will. Ms. Hilliard will certainly have the local media to shill for her. Curious, Xardox. Which local media? The Athens Banner Herald?